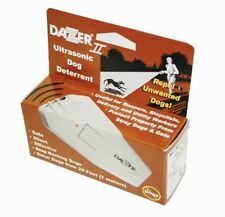 The DAZER is a compact handheld ultrasonic dog deterrent designed for use by the general public to protect yourself from aggressive, unfriendly dogs. Walk, jog, bicycle, work and enjoy the outdoors without having fear of stray, unfriendly dogs. Using the latest ultrasonic technology, the DAZER produces a discomforting but not harmful high frequency sound audible to dogs but not to humans. Help stop the approach of unfriendly, aggressive dogs as far away as twenty feet. The DAZER is the perfect personal protection device and makes a great gift for anyone that encounters dogs on the job or during their outdoor activities. Stop the dog approaching you before it can bite you. Condition: Used in good working condition. All parts are used and in good working order to the best of our knowledge. You are responsible for making sure you are ordering the correct part for your application. The Pet-Agree is great for basic training and behavior modification. It is truly a humane Pavlovian device based on the principles of classical and operant training. The Pet-Agree can be used for training to help stop your dog from jumping up on people, excessive barking, chasing cars, biting or clawing, digging or use it to help protect yourself and your dog while out. Stop the dog approaching you before it can bite you. #108 in Dog Repellents. Silent to humans, other people wont be bothered. Stop the dog approaching you before it can bite you. All Electronics are for U.S. electrical system. Band : Dazer KII. Stop the dog approaching you before it can bite you. Manufacturer : United States. 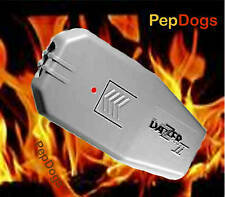 Stop dog attacks before they happen with the K-II Enterprises Dazer II Ultrasonic Deterrent Dog Trainer. The sound is not audible to humans but works to ward off unwanted dogs when out for a walk, jog, on your bicycle or anywhere there might be aggressive dogs. 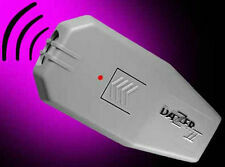 Dog Dazer II Ultrasonic Dog Deterrent. Using the latest ultrasonic technology, the DAZER produces a discomforting but not harmful high frequency sound audible to dogs but not to humans. Help stop the approach of unfriendly, aggressive dogs as far away as twenty feet. Using the latest ultrasonic technology, the DAZER produces a discomforting but not harmful high frequency sound audible to dogs but not to humans. Made of lightweight high impact plastic that includes a belt clip, low battery indicator and the 9V energizer battery. Stop the dog approaching you before it can bite you. Quality Products. Item Weight: 5.3 ounces. Stop the dog approaching you before it can bite you. Silent to humans, other people won't be bothered. Stop the dog approaching you before it can bite you. We would love to be given the opportunity to work with you to resolve any problem you may have. Stop the dog approaching you before it can bite you. Silent to humans, other people wont be bothered. The DAZER is the perfect personal protection device and makes a great gift for anyone that encounters dogs on the job or during their outdoor activities. - Battery included, Long life 9V battery lasts six months to a year (3 year shelf l ife). Using the latest ultrasonic technology, the DAZER produces a discomforting but harmful high frequency sound audible to dogs but to humans. Help stop the approach of unfriendly, aggressive dogs as far away as twenty feet. Stop the dog approaching you before it can bite you.